The International Cultural Resistance Film Festival of Lebanon proposes a multi-disciplinary, international competition inspired by the unfinished city designed and partially built by the Brazilian architect Oscar Niemeyer. In 2013 the first edition of Tripoli Cultural Resistance Film festival took place, bringing together filmmakers, artists, researchers and academics for a series of film projections and public events. Very quickly the beauty and potential of a singularly unique place – what is today known as the Rachid Karamé Space – inspired the desire to establish a wide-reaching artistic event that would complement the festival in its second edition, that is to take place in five different Lebanese cities. Lebanon in fact boasts two incomplete monuments: Baalbek, dating from Roman times, and the Niemeyer City which was built by Oscar Niemeyer in the 1970s and whose construction was interrupted by the civil war. 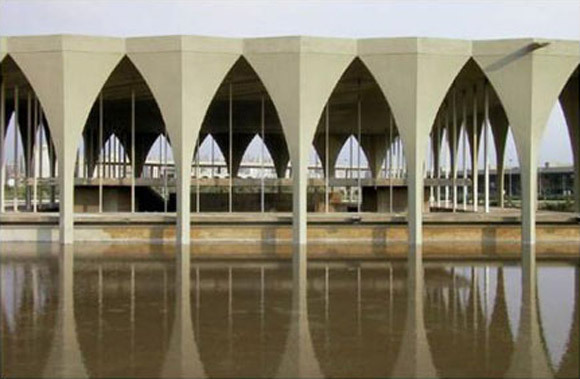 This monument is largely unknown outside of Lebanon and yet it is one of the six most beautiful Niemeyer constructions. Situated in an area that became a conflict zone, this incomplete series of buildings is now an extraordinary wilderness, which this competition intends to take over. The aim of the competition is to occupy the space and in some way give it back its original function: Niemeyer’s project was intended to house an international fair in the style of the Damascus and Baghdad fairs of the 1950s. To appropriate the space now as a setting for art exhibitions is therefore a logical continuation. “[This incomplete aspect] makes it eminently inspirational. But it isn’t a dislocated space as it is protected by the town as every object is a masterpiece of plastic art, a technical masterpiece so that the whole becomes a vast art installation.” (Daniel Guibert). The project fell within a logic of the urbanisation of Tripoli, the northern capital of Lebanon, thereby fundamentally uniting the destiny of the town’s inhabitants with this space which, placed between the sea and the town, opened up new horizons of expectations. When these imposing and experimental structures had to be abandoned the space of the Niemeyer City became, over time, an object of art in itself. The incomplete nature of these buildings calls for re-appropriation and a new proposal for its future. Researchers and artists of all disciplines and any geographical origin: we would like to offer you the opportunity to engage with, to reimagine and to revive the space, unfolding your art and your vision in the heart of the Niemeyer City. “What are the possibilities of resemantising the architectonic utopia of high modernism once the irreducibility of incompletion and fragmentation have been acknowledged? What types of symbolic reconfiguration of the communal construct – and of the construction of the communal – are the contemporary arts able to offer today, precisely insofar as they possess an unprecedented knowledge and experience of the possibilities of representation opened by discontinuity and interruption, precisely insofar as their new artistic languages rely on strategies of fragmentation and montage which far from generating a locked, essentialised meaning, detonate a process of signification which resists and overwhelms the intentional will for a closed system?” (Andrés Claro). “The Niemeyer City: incompletion and the sense of history” by Andrés Claro. “Parataxe and para(-)sites” by Daniel Guibert. The International Cultural Resistance Film Festival intends to open its third edition in 2015 with a biennale at Tripoli, thereby arousing the ghosts of the international fair conceived and given form by Niemeyer in the 1960s. As the competition is multidisciplinary it is addressed as much to architects as to poets, video artists, writers, photographers, filmmakers, performers, and painters etc. The format of the proposition is wide open and accepts documentary films, photographic creations, animated short films, installation art etc. Proposals must be registered before 1st March 2015. All registered projects will be entered into the competition and have the opportunity of being presented in Tripoli. It is therefore imperative that the registration of the work includes as much detailed information as possible about the nature of the work, in order to make the competition feasible. The organisers of the competitions are unable to provide any financial support for the creation of the submitted works. The final date for submission is 1st September 2015. Exhibition of works: this will take place within the frame of an art biennale at Tripoli to be held during the Cultural Resistance International Film Festival. All the works registered, submitted and completed in their entirety, will be presented in Tripoli at the Rachid Karamé / Niemeyer Space in November 2015, as well as being presented at several locations around Lebanon. 3 projects will win a residency in Brasilia, the city created by Oscar Niemeyer and Lucio Costa.